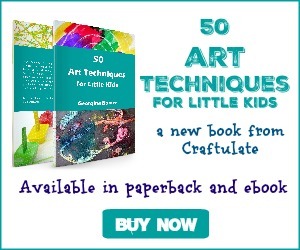 If you’re looking for kids painting ideas, check out these awesome art projects! This is a guest post written by Nicola of Crafty Kids at Home – check out her blog if you don’t already know it! My Crafty Kids love to paint at home. We seek inspiration from our beautiful surroundings over here in Ireland and my kids having a growing interest in art history. We are always looking for new ways to work art projects into our activities and we love to experiment with different painting techniques as we go along. Painting is the ultimate rainy day activity. It’s quick and easy to set up and it’s the perfect activity for kids of all ages to do together. You can either leave your kids free to paint with their own imaginations and a few simple paints and brushes or you can set up a more structured themed art project. Here are just a few of our favourite kids arts projects to get your own creative juices flowing. What will you paint with your kids this week? Love the idea of painting, but not the mess that it can create? 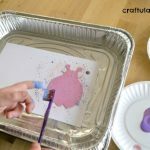 Then you have to try this Mess Free Shake It Up Painting Activity. There is so much more to painting than just using brushes. 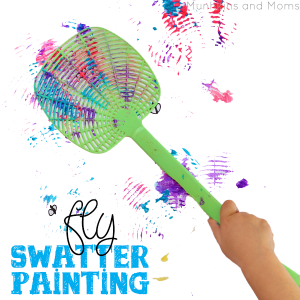 Did you know the Fly Swatters make for a fun painting tool? Sponges are brilliant for painting with as well. 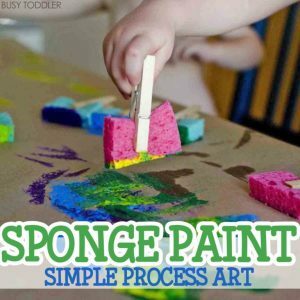 Check out this awesome Sponge Painting Process Art Activity. Rolling small items in paint is the perfect way to add interesting textures to your artwork. Have you tried rolling paint around in peanuts before? Adding spices to your home-made paints turns your art session into a multi sensory experience. 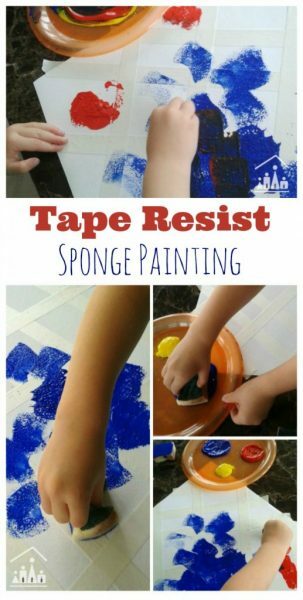 We had so much fun combining our two favourite ways to paint in this Tape Resist Sponge Painting Activity. This Wet on Wet Watercolor Project couldn’t be simpler and is sure to fascinate budding artists. Rolling paint covered cars down a ramp? What could be more fun than that? You have to try this one out! Thank you so much to Georgina for inviting us over to share our favourite kids painting ideas with you all! Always looking for fun ideas for my classroom for students with autism!